With earnings season in focus, investors have temporarily put Fed worries and economic issues on the back burner in favor of seeing how U.S. businesses performed last quarter. Thomson Reuters analysts predict that S&P 500 companies saw their profits decline by 2.9% from Q1 2014. Falling oil prices and a strong dollar likely chipped away at energy company earnings as well as those of firms that depend on overseas sales (and had to convert profits back into dollars). 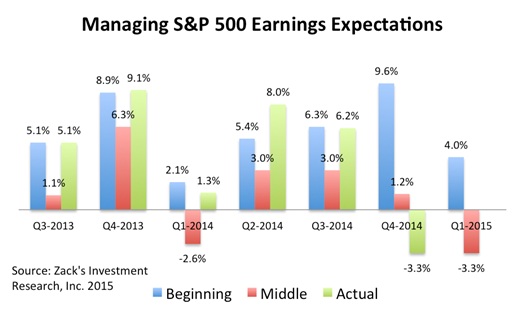 Earnings estimates have come down sharply in recent months. In the chart below, you can see that for the past year, the trend has been for earnings expectations to start relatively high (in blue), drop significantly as the quarter proceeds (in red), and then, in three of the last four quarters, exceed expectations (in green). Corporate managers have an incentive to set the bar low so that they can over-deliver on earnings and reap the reward as investors react positively to the news. However, past performance is no guarantee of future return, and we're not guaranteed to see positive earnings surprises this season. The size of negative earnings revisions is unusually large as companies were forced to account for slower economic growth and volatile oil prices. However, we can remain hopeful that the historical trend will hold. As we look toward the official start of earnings season this week, we can count on seeing some winners and losers. While energy companies will likely be hit hard by petroleum prices, financial firms and medical firms may see outsized performance. Though we can't predict the market, we can stay alert for opportunities amid the potential volatility. Wholesale inventories edge up in February. Warehouse stocks of products for sale rose slightly in February, indicating that businesses may not be restocking aggressively because of weak sales. Import prices fall in March. The cost of imported goods fell last month as rising oil costs were offset by declining prices elsewhere. Import prices are a major contributor to inflation calculations and weak inflation may delay the Fed's interest rate increases. Weekly jobless claims rise less than expected. The number of Americans filing for new unemployment benefits rose slightly last week, bringing the four-week average to the lowest level since 2000. These numbers suggest that the slow job growth in March was a seasonal fluke. Oil prices stabilize on production plateau. Global oil prices rose for the fourth straight week on expectations that drilling production will stabilize and the supply glut will recede. The number of oil rigs in the U.S. has dropped significantly, indicating that domestic production may be topping out.